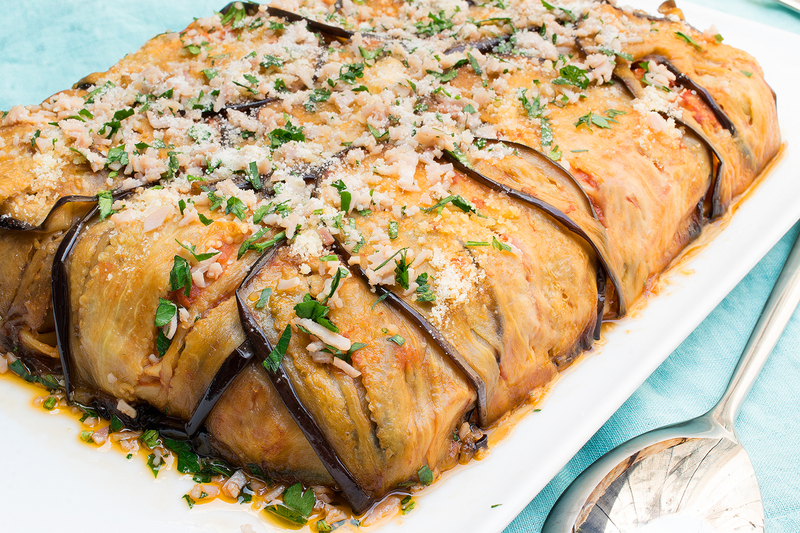 Eggplant Recipe: Celebrate Mother’s Day Like an Italian! Buona Festa della Mamma – Happy Mother’s Day! It’s not a coincidence that I named my own blog Coco de Mama, which translates to “Mamma’s Boy” in Italian. Mamma has taught me everything I know about cooking and life and has always supported me through thick and thin. You see in almost all Italian families that the Mammas and Nonnas (grandmothers) are put on a pedestal by their sons, and are loved and adored. To celebrate Mother’s Day, I put a recipe together combining Mamma’s favorite ingredients; eggplant and tagliatelle, but baked in the shape of a cake, so when she cuts into it she sees a delicious surprise. I based this recipe on our traditional Sunday lunch dish, Involtini alla Norma, but I made it this time with a twist. It has a striking presentation that can also feed a family celebrating Mamma’s special day. On these occasions, I like to make sure the table is set perfectly with Mamma’s favorite dishes, her favorite flowers and candles that glow to make the room look extra special. These are the little things that Mamma always notices, and I’m happy to do for her. Although this dish looks incredibly sophisticated, it is actually very easy to make, since it is basically a baked pasta dish. Follow the recipe and fry the eggplant, do not grill them, because the taste will not be nearly as delicious as this recipe. Mamma deserves the best! Buon Appetito and Happy Mother’s Day! 1. TOMATO SAUCE: Heat the olive oil in a large saucepan. Add the garlic and saute for 2 minutes. Add the tomatoes, salt, and black pepper to taste and simmer on low heat for 20 minutes. Stir in the basil leaves, turn off the heat and set aside. 2. EGGPLANT: Slice the eggplant lengthwise and cut into 1/4-inch slices. Sprinkle the slices with salt on both sides. Set aside. In a 12-inch non-stick skillet heat the olive oil. The oil should be 1/2-inch high. Pat the eggplant slices on both sides with a cotton towel and make sure they are dry. When the oil is very hot, add 3 or 4 slices of eggplant and fry until soft and golden brown on both sides. 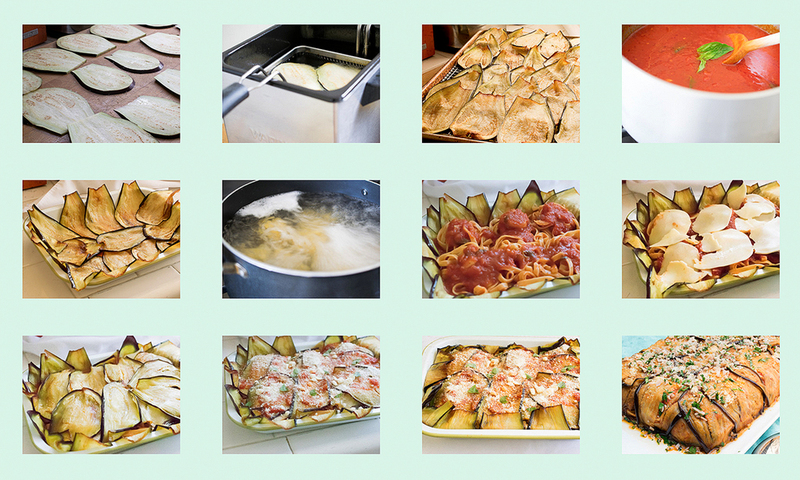 Transfer the cooked eggplant to a large tray lined with paper towels or onto a cooling rack. Let them cool. Fry the remaining eggplant and set aside. 3. PASTA: Bring a large pot of salted water to a boil. Add the pasta and cook, stirring occasionally, until very al dente, about 5 minutes. Drain and transfer immediately to a large bowl. Toss it with olive oil to coat, cover with plastic wrap and set aside. 4. ASSEMBLY: Preheat the oven to 350 degrees F. Pour half of the tomato sauce in the pasta, adding the Parmigiano and toss together. Butter a 9″x13″ baking pan and line with eggplant slices, overlapping slightly and allowing slices to hang 2 inches over edge of pan. Pour pasta mixture into eggplant-lined pan. Press pasta gently to fill the pan. Top with the remaining tomato sauce. Add the mozzarella slices on top of the sauce. 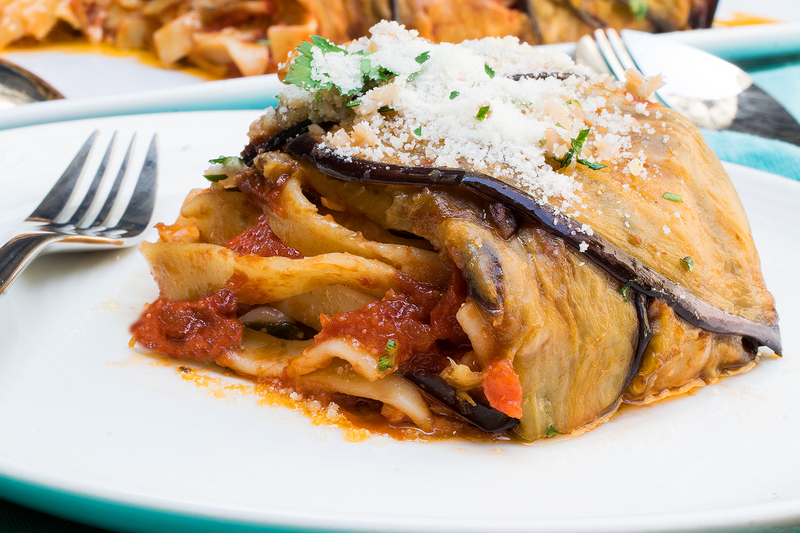 Cover the top of the pasta with remaining eggplant slices. Fold overhanging eggplant over filling. Bake for 30 minutes or until heated through and bubbling. Remove and let rest for 10 minutes. Flip pasta cake onto a serving plate. Add the finely chopped ham, parsley, and sprinkle the Parmigiano on top. Cut into wedges and serve. This entry was posted on April 27, 2015 by Terlato Media. It was filed under COOK LIKE AN ITALIAN, Francesco Romano . What a great Idea Francesco! Thanks for sharing, I really enjoy your posts and trying out your delicious recipes. Please keep them coming! Thanks, Francine! I’m glad you enjoy them – buon appetito! This is fantastic! So sophisticated and yet your photographs make it seem doable. Lovely “cake”. That is possibly the most beautiful thing I’ve ever seen. What an opportunity for leftovers! That’s a great idea – you could make this on a weeknight and have dinner for the rest of the week! Enjoy, Connie!